On the day of our departure from the U.S., for the international leg of our round-the-world trip, I spent part of the day watching my friend Sheri sort through stuff that had lingered in her childhood bedroom. Among other ephemera, she found letters I wrote to her during the first weeks of college fourteen years ago. Sheri’s parents house was my second home in junior and high schools. Her family always had M&Ms, soda, and cookies, whereas mine stocked up on salad. They had a large, above-ground pool with a wrap-around deck and a slide, which I helped clean each summer. Sheri had a trundle bed, perfect for me to curl up on, talking with Sheri until we both – bookworms that we were – read before going to sleep. Her parents are selling their house. They say you can’t go home again. I can still go back to Long Island, but there’s a little less there for me every time. But then again, there’s a little more there too. It turns out that being 32 years old and still having many of the same friends you made when you were 12 is unusual. Fourteen years after we both graduated from East Meadow High School, Todd and I regularly – and in some cases frequently – hang out with friends from the class of 1994. Most we know from seventh grade, and a few Todd knows from elementary school. When we swing by the Island these days, Todd and I not only have the most amazing families to visit but also a tribe of friends. Even when friends move on from Long Island, as so many have, the tides and times bring us together. We rejoin for weddings, births, departures, and by convenient coincidence. Our friends are having kids too, so the tribe’s growing. And they’re all buying houses with guest bedrooms, just in time. So here’s to Long Island – raise your fork full of baked ziti high! This recipe only requires assembly, rather than actual cooking, so it’s pretty easy. If your recipe for baked ziti doesn’t have ricotta in it, you’ve been eating a pale version of the real deal. Boil ziti according to package directions, undercooking a bit. Drain ziti, put back in pot, and mix with marina sauce (you may not need all the sauce, the pasta should be well-coated but not swimming in sauce). Layer half the ziti in the bottom of an ungreased casserole dish (about 10″x14″ should do). Using a soup spoon, place dollops of ricotta (use full container) onto ziti layer – do not spread the ricotta, you want puddles of it to be tucked into the pasta. Scatter three-quarters of the mozzarella on top. Gently layer the remaining ziti on top. Top the ziti with the remaining mozzarella, a generous drizzle of olive oil, and a sprinkling of parmesean. Place in a 400 degree oven, uncovered for 15 minutes. The tips of ziti that stick up should brown and turn a little crispy. If this doesn’t happen, turn your broiler on briefly so it does. Remove from oven, and allow to cool a bit before serving. 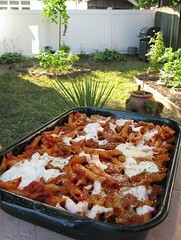 the ziti was definitely the very best I have ever made– broiling the top to make it crisp was clearly the way to go.